Lan arrived in a big box, probably the same size as the one used for the larger dolls. New design and new logo on the lid, I think it's really elegant. The box itself is a kind of metallic, silver/champagne-coloured sturdy cardboard. Lan was safely tied with ribbons to a cushion; the box is also padded on the sides. She was wearing a mask to protect her face. Her wig is synthetic but very soft and flowing. I chose the white wig. 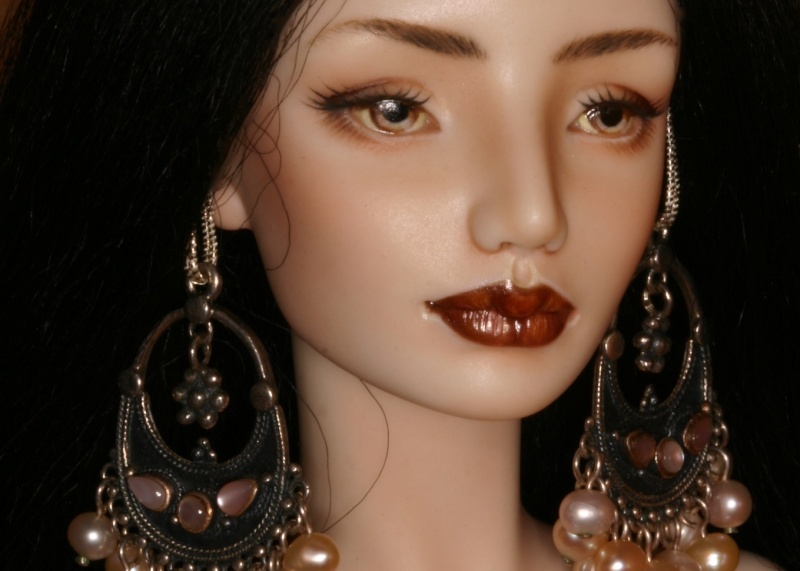 The paint job on her face is stunning and absolutely flawless; she also has glued eyelashes. Her ears are pierced. The lace parts on her chest and back are exquisite; the details are awesome on such a tiny scale. The blushing on the body is perfect; you can also see the tiny blue veins on her wrists! The new material - Moonglass - keeps all its promises and is up to my expectations. It sounds like porcelain; looks quite resilient - the wrists and ankles are paper-thin but look very strong. It's pretty light and feels like ceramics although a little more grainier - but not unpleasant to the touch. It's milky white and has a natural opalescence which almost gives the doll a kind of aura. Difficult to put it in words. You really have to see it for yourself. My only regret is that the joints are not sueded so you have the -unpleasant - grinding of the joints you also get with porcelain. All in all this doll is amazing and is another example of Eli's talent. another lovely beauty! how is she posing? Despite the lack of sueding, she can hold her poses beautifully. Oh she is really beautiful, you must be over the moon with her! What a magnificent work of art. You are so right about the moonglass, it does need to be seen to be believed, it lends a genthle ethereal glow, makes your girl look so sylph-like and I love the slender sculpt of these smaller dolls. The lace chest works well with moonglass, it looks amazing. Beautiful doll. I need to order one of Eli's smasller dolls!!!! Wonderful doll, as are all of Eli's dolls. I suppose you could easily suede her yourself. She does "glow" in your photos! I love her look. She is very beautiful and unique. It's too bad about the sueding though, that would drive me nuts. I wonder why she didn't do it? She seems to be a very quality focused artist so surely it can't just be neglect for detail or laziness, there must be a reason. I believe there was an option for sueding, still spring tension or elastic cord and other details. Every option has a price. I emailed Eli to give her some feedback about the new dolls, boxes and so on and asked about the sueding. She answered that she used a new technique: the joints are coated with resin and some "gripping" powder to help the dolls hold their poses. She also said that some customers complained about the aspects of leather on the joints....You can't please everybody I suppose....Unfortunately it doesn't prevent the grinding noise. IVdoll: I checked the ordering mail I received, I don't think sueding was an option. It was with the resin line but I thought sueding was included with porcelain/mooglass dolls. The bigger dolls are sueded. It's true that the leather layer can look quite distracting, especially in a tiny doll like this. I think the tiny porcelain Enchanted Dolls also have epoxy/resin coating instead of leather. Are you sure about that? 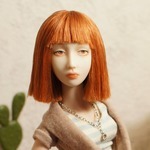 The photos and videos I've seen of the most recent porcelain ED dolls show joints sueded with leather. Personally I like this finishing touch and the aspect it gives the doll; besides the practical use of leather - protecting the joints, enabling the doll to pose better, avoiding the grinding noise... - it clearly identifies the doll as porcelain, or in this case Moonglass. Maybe she does now use leather- it is true I was thinking of the older dolls, I don't know anyone with a newer doll. No, it's not a special commission. I placed the order when the Moonglass line was launched in March 2015.